Breaking News! Godzilla Spotted In Chiba.....Wait....Its A Tree! Wait.......cancel the alert......it's just a tree...? This tree in Chiba Prefecture has gained a lot of press in Japan over the past couple of days because.....well...it looks just like Godzilla. The owner of the property, where the "King of the Tree Monsters" resides, insists that she did absolutely nothing to the tree to make it look like Toho's famous movie icon. 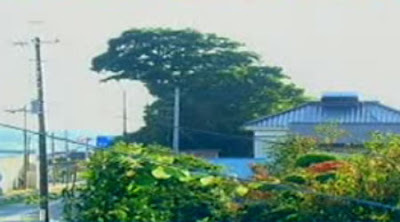 Isn't it amazing that a tree that looks like the profile of Godzilla would be spotted in Japan? And people insist that there is no God? I think this one proves His existence....and His sense of humor.